Professor Bob Diaz of the Virginia Institute of Marine Science, College of William & Mary, today briefed Congress on the ecological effects of the chemical dispersants used in the Gulf oil spill. As an example, Diaz noted that white, pink, and brown shrimp-important targets of the Gulf fishing industry-all spawn offshore, with juveniles subsequently moving into coastal nursery areas. He said that crab larvae-important food for many other species-have already been found with droplets of oil under their shell. Diaz noted that migratory animals-including Atlantic bluefin tuna-enter Gulf waters during sensitive parts of their life cycle. "The Gulf of Mexico is an important spawning and nursery habitat for these fish," says Diaz. "They're drawn by the Gulf's warm waters, abundant prey, and Sargassum-a type of floating seaweed that harbors an ecosystem of its own." During his briefing, Diaz also discussed biodegradation-the process by which bacteria and other microorganisms metabolize the various compounds in petroleum. Diaz noted that the biodegradation depends on the type of dispersant used, its application method and rate, the type of crude oil present, and the composition of the microbial community. Because metabolic rates decrease with both water temperature and depth, Diaz says that the efficiency of oxygen depletion decreases with depth as well. He estimates that microbes would require 187 barrels of oil per square kilometer to lower oxygen levels by 10 per cent in the Gulf's surface waters (0 to 600 feet), 400 barrels/km2 for a 10 per cent oxygen reduction between 600 and 2,400 feet, and 650 barrels/km2 from 2,400 to 4,500 feet. His estimates assume that the oil is uniformly distributed throughout the water column. 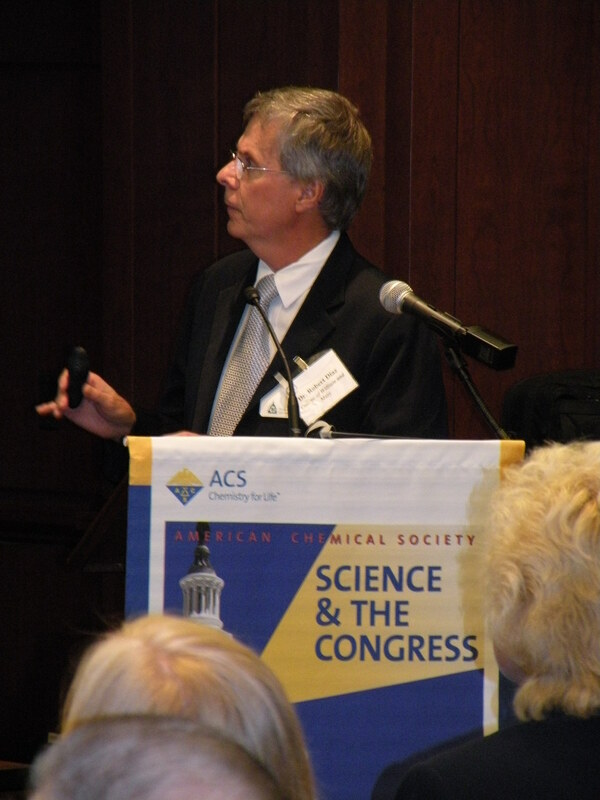 Videos of the briefing will be available on the ACS Science & the Congress website in a few weeks.